Cincinnati, Ohio / Frankfurt Armor Holdings, Inc (NYSE: AH), a leading manufacturer and distributor of security products and vehicle armour systems serving the US$1,100 million military, law enforcement, homeland security and commercial market, announced the launch today of the IE-Defense System™, the world’s first SUV and commercial vehicle armour system, to protect against attacks from Improvised Explosive Devices (IEDs). The IE-Defense System™ is a unique multiple threat system that can be applied to various commercially-available Sport Utility Vehicles (SUVs) and other passenger vehicles, which account for US$620 million of the global vehicle armouring market. It protects the vehicle’s occupants against an IED attack and subsequent attack by assault rifle with armour-piercing bullets. 75 per cent of attacks on vehicles involve IEDs rather than bullets, so the system has been tested to withstand high-energy fragments up to 20mm, typically the largest fragment from a roadside bomb. IE-Defense System™ underscores Centigon’s commitment to leading technology and to responding to the global security threat. ‘As IED attacks have become more commonplace, particularly in Southwest Asia, a growing number of government officials, private contractors, NGOs, private individuals need protection. IE-Defense System™ is a major step towards neutralising the threat many of these people have to face every day,’ Dr Russell added. Armor Holdings, Inc is also introducing a new single brand, CENTIGON, for its armoured vehicle business, to better leverage its combined global capabilities in the marketplace and to present a unified face to customers around the world, Gary Allen, its new President, announced. The new company combines the commercial vehicle armouring operations of the Armor Holdings Mobile Security Divisions, including AMS - France (formerly LABBE), AMS - Germany (formerly TRASCO) and O’Gara-Hess & Eisenhardt (USA and Latin America). In 2004, Armor Holdings’ Mobile Security Division had sales of US$125 million and armoured approximately 1,400 commercial vehicles worldwide. Centigon’s global leadership is driven by its fundamental commitment to research, development, testing and evaluation (RDT&E). Centigon spends more annually developing and testing new technologies than any other company in the industry. Centigon, a division of Armor Holdings, Inc (NYSE: AH), is the world’s leading commercial vehicle armouring company. Centigon armours passenger vehicles independently and in partnership with OEMs for government and commercial customers. Centigon also armours Cash-in-Transit vehicles for the world’s leading Cash-In-Transit providers. Headquartered in Cincinnati, Ohio (USA), Centigon has production facilities and sales operations in Ohio, France, Germany, Mexico, Colombia, Brazil and Venezuela. Via un communiqué de presse, accompagné de photos de la bête, on peut constater que Range Rover entend investir le segment (limité ?) des voitures blindées. “Entièrement blindée, elle a été conçue pour résister aux attaques à la mitrailleuse ou à la grenade de main tandis que son dégagement au sol et ses quatre roues motrices permettent une fuite rapide dans un guet-apens.” Tout un programme ! L’intérêt d’un tel véhicule blindé est bien entendu sa capacité à être à l’aise sur tous les types de terrains, à la différence des limousines. It looks just like any other new Range Rover Vogue, but beneath the skin it's a very different story. To provide the ultimate in occupant safety, this Range Rover Vogue goes well beyond the capabilities of air bags and seat belt pre-tensioners. Fully armoured, it has been designed to resist attack from machine gun or hand grenade while its four-wheel drive chassis and off-road ground clearance allows a quick getaway from attack or ambush. Unlike conventional armoured limousines, the Range Rover Vogue Security Vehicle can be driven across all terrains, including unforgiving urban obstacles like high kerbs or even steep steps. Its broad shouldered strength also allows it to be driven at and through obstacles such as gates or even walls. 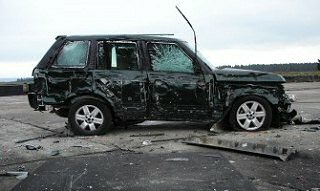 In an attack, the Range Rover Vogue's armour and its go anywhere ability can literally mean the difference between life and death. Developed by Land Rover Special Vehicles as an integral part of the new Range Rover Vogue programme, the Range Rover Vogue Security Vehicle is the first armoured Land Rover vehicle to be offered as a production model. In future, there will be greater availability of other armoured Land Rover products as well as high security models from other marques in the Premier Automotive Group, all developed to the same exacting standards. The new high security Range Rover Vogue will be available to four levels of security, the first three offering protection from attack by hand-gun, assault rifle or high velocity rifle. The ultimate version provides protection against armour piercing to European B6 plus standard, and is capable of withstanding attack from a NATO 7.62 ball round fired from 10 metres at a typical velocity of 830 metres per second. B6 plus standard, favoured by Heads of State and other diplomatic, political and religious 'targets', also protects against attack by weapons including the Kalashnikov AK47 rifle. 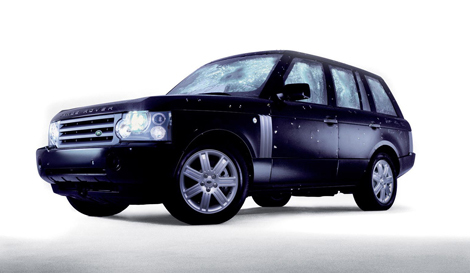 Also available will be a Range Rover Vogue Security Vehicle built to B4 standard, which protects against attack from a .44 Magnum handgun using flat nose, full metal jacket, soft core ammunition at a typical velocity of 440 metres per second. On all vehicles, the floor pan is protected to defeat the simultaneous detonation of two DM51 hand grenades rolled in its path. Improved protection to L2A2 hand grenade level is available as an option. Armouring materials used range from ballistic and blast steel to carbon weave materials such as Kevlar as well as non-metallic materials such as Spectra-shield and Dyneema. The glass is plasma cut, fixed on all four doors and up to 40mm thick to withstand attack - the thickness of the glass is virtually the only visual external clue to an armoured Range Rover Vogue. Great attention to detail ensures that occupants will not be affected by 'splash', the term given to shrapnel - often molten metal - that can penetrate the body via potentially vulnerable spots such as door shuts or handles and injure or kill occupants. Overlaps on doors are specially designed to prevent splash entering the passenger compartment. Added protection has been given to the vehicle's fuel tank and battery while the tyres all have run flat capability. A heavy duty jack and strengthened jacking points are also fitted. Development work has been carried out by Land Rover Special Vehicles working closely with one of the world's leading armouring specialist companies, Armour Holdings Group, that includes O'Gara Hess and Labbe. 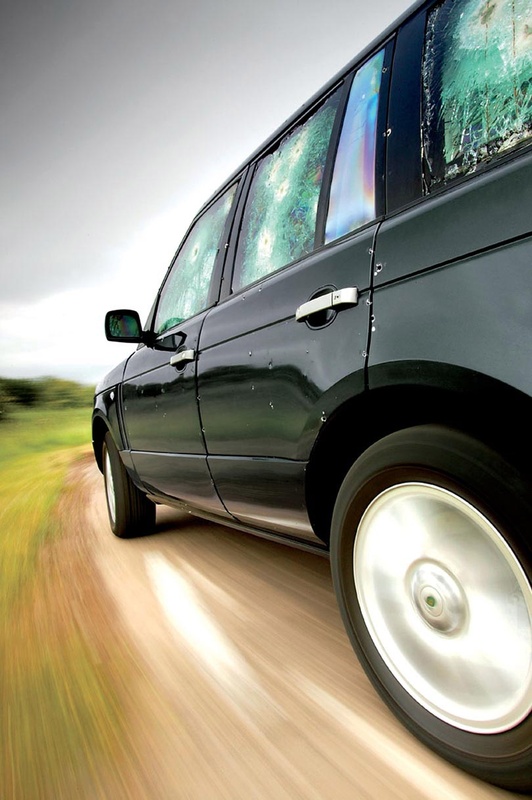 Testing of the vehicle's armouring is being carried out by QinetiQ, an independent scientific company that was formally an integral part of DERA, the British Government's Defence Establishment Research Agency. Adding as much as two tons of armour takes the vehicle's all-up weight to nearly 3.5 tons. To ensure that it still behaves like a Range Rover Vogue, vehicle development experts Prodrive Ltd have extensively retuned the air suspension, chassis and braking systems to cope with the extra weight and the demands likely to be placed on the Range Rover Vogue. A comprehensive list of options takes the protection offered by the Range Rover Vogue Security Vehicle to even greater levels. They include an internal oxygen system, darkened glass and an intercom. Covert emergency lights and a siren are also available. Other options are available to meet customer's specific requirements.